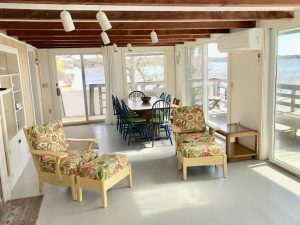 Come stay, play, and learn with us in one of our two waterfront cottages on Pleasant Bay! • Eligibility for all other PBCB lessons, classes, activities and use of some of our boats. You can learn to sail, participate in marine science programs, and learn more about environmental stewardship! Lesson and boat rental fees apply, and enrollment and seamanship qualifications are required. Contact stayandlearn@pbcb.cc for more information. 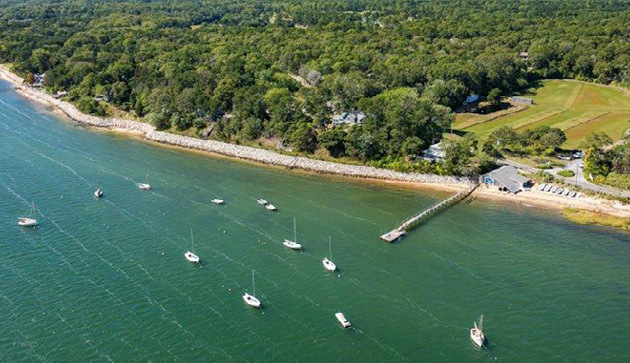 Both vacation homes, South Cottage and Square Top, are located on 3.6 acres of waterfront property with the tides literally at your doorstep. Enjoy your morning coffee and your evening meals on the rustic decks overlooking the bay. Spend your day beachcombing, exploring the Cape, or sailing with PBCB on beautiful Pleasant Bay. This 6-bedroom 3.5-bath home is a perfect setting for two families or a multi-generations vacationing together. It includes a full kitchen, dining room, spacious living room, and has two master bedrooms with private baths located on opposite ends of the first floor. Additionally, 4 bedrooms are located on the second floor. All bedrooms have views of Pleasant Bay and beyond to the Atlantic. This 4-bedroom, 2-bath home has the best view on the bay. 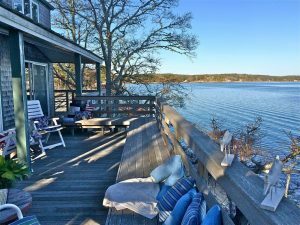 The open floor plan spills onto an expansive deck overlooking Pleasant Bay. It has a fully equipped kitchen and its spacious dining and living rooms offer spectacular water views. "Our week on Pleasant Bay brought back childhood memories of summers on the Cape. To be able to share, with our boys, the magic of simple pleasures – clamming on the shore, puzzles and games on the table, steaming lobsters, sailing in the sea – was a slice of heaven!"